This is a tangled tale. 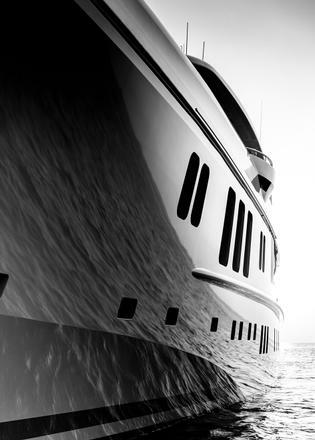 The story of this superyacht starts in the middle, involves duplicate characters and it hasn’t quite concluded, even yet. And we can’t name her — or the crew. But these threads are special: a 73.5 metre yacht built at a leading German yard and not one but two sets of top-notch designers. And — adding a dose of intrigue — she is ultra secret, unveiled here for the first time. We had to sign non-disclosure agreements and volley months of emails until we were finally choppered in for a glimpse inside. It was worth it. The boat is a coherent and homely yacht, which functions in perfect harmony with the Damen yacht support vessel 6711 that the owner later commissioned to run alongside her. To begin at the beginning (sort of): Imperial Yachts brought its client to Nobiskrug in 2011, where there was a project that might suit him. “The hull was already under construction, shortening considerably her delivery period. 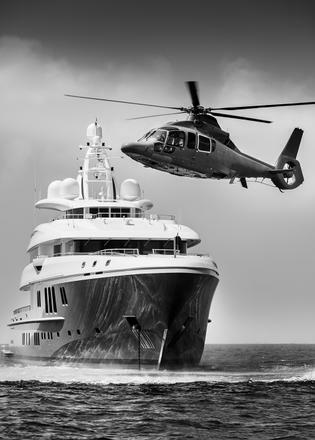 She was an excellent financial proposal from a premium German yard like Nobiskrug,” says Evgeniy Kochman, founder of the Monaco-based brokerage house. “Under construction” is somewhat of an understatement. Project 783 was about a month away from delivery to her build owner, who had recently taken possession of another 73.5 metre from the same yard, Mogambo. The boats share an engineering platform but UK-based studio Reymond Langton Design, responsible for both yachts, had given them distinctive characters inside and out. Imperial’s client certainly appreciated the results. 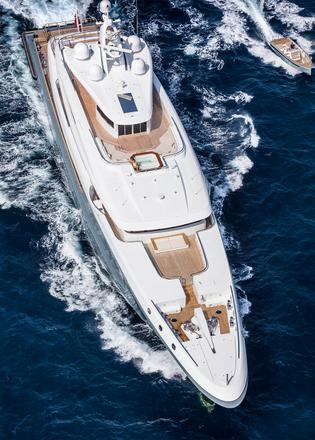 “Her modern hull and superstructure design, far from the old and classic shape seen everywhere on all seas, corresponded to our client’s tastes,” says Kochman. He also liked what Langton describes as the “architectural” approach to the interior spaces. The living spaces outside were just as much of a draw. 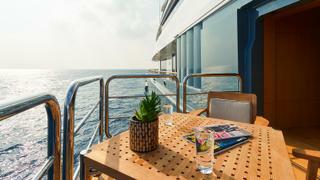 These run from an enormous main aft deck, with dining as well as sunpads, to an outdoor cinema (with more sunpads and dining) on the sundeck aft, and, on the same level, a spa pool and all the bells and whistles you’d expect of a yacht this size, plus a glass-enclosed superyacht gym. The décor, however, complementing those feminine lines with pale tones and silver detailing, was not to the prospective owner’s taste. Enter designer Mark Berryman. “He’s definitely an oak man through and through. He likes his warm woods,” says Berryman of the owner. “We probably ripped out about 80 per cent of the interior.” And they had just six months. Out went the main saloon bar, replaced by a library with a piano, while seating and cabinetry was reconfigured here and in the upper saloon. 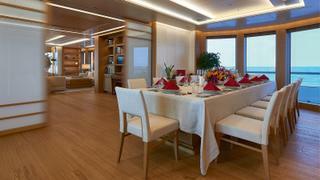 The most significant changes were in the main deck owner’s suite. 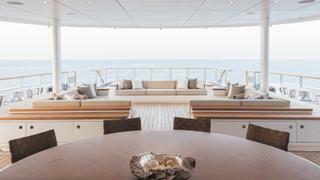 It had been divided into a full-beam cabin forward, with a smaller space aft containing a fold-down bed by a shell door, which itself folded down to create a superyacht terrace. “Our client does a lot of work while he’s on board so it was important to make that a bit of an office space for him,” says Berryman. The desk faces inboard to avoid distraction when the shell door is open. In terms of décor, the only element that remained was the bleached sycamore on bulkheads and deckhead panels, which there wasn’t time to remove and that could be seamlessly incorporated into the new decorative style. Berryman describes this new theme as “classic with a bit of contemporary Asian — we used a lot of bamboo”. Throughout the lower deck guest suites warm European oak is combined with tactile, caramel coloured rattans and bamboo, wicker chairs by Glyn Peter Machin and driftwood lamps, while neutral fabrics help retain the airy feeling that is such a valuable feature of the spaces. In the master suite Berryman says the overriding feature is the abundance of space, a claim often made of cabins but rarely true. It is here. Those massive head heights combined with the full-beam hidden storage and full-height windows (with oak shutters that disappear into pockets) make the 2 x 2.1 metre bed seem positively diminutive in the vast space. You hardly notice the sofa, custom designed by MBD and built by Henrik Lang in Hamburg, or the breakfast table built by Parkway Interiors in the UK. Forward, chequerboard doors slide open to reveal dressing rooms and a sprawling bathroom in beige limestone, contrasting hazelnut-toned Travertine noce and — the dual centrepieces — a monolithic bathtub by Kaldewei and a glass-sided rain shower vast enough to replicate a thunderstorm. Berryman employed a few ceiling tricks in the suite. The cabin features a lighter shade of bamboo in the recessed overheads to “not bring the ceiling down” and the bathroom has an acid etched set of backlit ceiling panels, which “gives the feeling of a skylight above”. But it is in the main saloon that the benefit of Langton’s “architectural” approach blends most appealingly with Berryman’s design. There’s a distinctly residential feeling generated by those flat walls, massive head heights and full height windows, combined with cosy elements such as bookcases, niches for objets d’art, lamps and pot plants. The temporary separation of spaces has been stylishly handled too, from the shoji screen-style smoked glass that slides between the main and dining saloons while allowing light through, to the panel between the owner’s cabin and office that looks like a permanent wall when closed, to the invisible crew door between the dining saloon and pantry forward — all of which operate smoothly at the push of a button. There are clever tech touches all over. 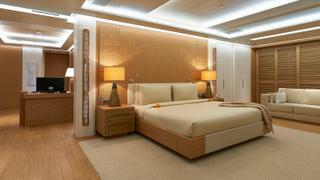 “The master cabin has biometric security access,” says the captain. “So the door locks and you’ve got a palm reader to get in — or you can issue a fob, if the person staying there is not a regular guest.” The rack rooms and ship’s server have the same security measures, to protect private data. 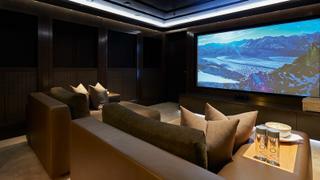 The upper deck cinema — set up for games consoles as well as films — is likely to be the most popular “techie” area. 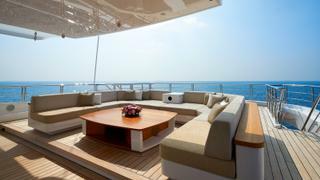 But guests may well prefer to spend their days in the superyacht beach club, which features a hammam and steam room as well as a dive compressor. Forward of this space lie two large side-opening tender garages: the port holding the main guest X-Craft tender, and the starboard, relieved of its RIB by the support vessel, contains various water toys and wetsuits. Behind the scenes, making all this work together, are some impressive service areas. Kit in the galley was significantly beefed up. “There are induction hobs, a deep fryer in the corner, an electric grill, two combi steam ovens… they’re the business,” says the chef. There’s also a television that broadcasts to the kitchen from a camera above the table on the bridge aft deck, thus supplementing crew communication by radio. “It is great to see what’s happening because sometimes a guest might stand up and walk away, so everything has to [be put on] hold,” he says. The radars were upgraded to Northrop Grumman by Sperry Marine, which the captain describes as “pretty impressive software”, as is the depth sounder, forward-looking sonar and much more. Here, as in the sprawling engine room, there are ample private spaces for crew to do their jobs: two offices off the bridge and a large engine control room down below. The finished yacht — and her support vessel — have been carrying her owner on world-roaming adventures almost continuously for five years. So why is the story not quite finished? Both Project 783 and 6711 are offered for sale individually. But with the experience they now pack on board, the next chapter should be a lot simpler than the first.